"Motorway" redirects here. For the 2012 Chinese film, see Motorway (film). "Freeway" redirects here. For other uses, see Freeway (disambiguation). "Control of access" redirects here. For the security concept, see Access control. The interchange between US 131, M-6 and 68th Street in Wyoming, Michigan, United States, shows many of the features of controlled-access highways: opposing traffic on separate carriageways, no at-grade intersections and no direct access to properties. This sign, or some variation thereof, is used to denote controlled-access highways in many countries. A controlled-access highway is a type of highway which has been designed for high-speed vehicular traffic, with all traffic flow ingress- and egress-regulated. Common English terms are freeway (in Australia, South Africa, United States and Canada), motorway (in the United Kingdom, Pakistan, Ireland, New Zealand and parts of Australia) and expressway (parts of Canada, parts of the United States, and many Asian countries). Other similar terms include Interstate and parkway. Some of these may be limited-access highways, although this term can also refer to a class of highway with somewhat less isolation from other traffic. In countries following the Vienna convention, the motorway qualification implies that walking and parking are forbidden, and they are reserved for the use of motorized vehicles only. A controlled-access highway provides an unhindered flow of traffic, with no traffic signals, intersections or property access. They are free of any at-grade crossings with other roads, railways, or pedestrian paths, which are instead carried by overpasses and underpasses. Entrances and exits to the highway are provided at interchanges by slip roads (ramps), which allow for speed changes between the highway and arterials and collector roads. On the controlled-access highway, opposing directions of travel are generally separated by a median strip or central reservation containing a traffic barrier or grass. Elimination of conflicts with other directions of traffic dramatically improves safety and capacity. Controlled-access highways evolved during the first half of the 20th century. Italy opened its first autostrada in 1924, A8, connecting Milan to Varese. Germany began to build its first controlled-access autobahn without speed limits (30-kilometre (19 mi) on what is now A555, then referred to as a dual highway) in 1932 between Cologne and Bonn. It then rapidly constructed a nationwide system of such roads. The first North American freeways (known as parkways) opened in the New York City area in the 1920s. Britain, heavily influenced by the railways, did not build its first motorway, the Preston By-pass (M6), until 1958. One green or blue symbol (like ) appears at motorway entry in countries which follow Vienna Convention. Exit is marked with another symbol: . The definitions of "motorway" from the OECD and PIARC  are almost identical. Motorway: Limited-access dual carriageway road, not crossed on the same level by other traffic lanes, for the exclusive use of certain classes of motor vehicle. Freeway: A divided major roadway with full control of access and with no crossings at grade. This definition applies to toll as well as toll-free roads. Freeway A: This designates roadways with greater visual complexity and high traffic volumes. Usually this type of freeway will be found in metropolitan areas in or near the central core and will operate through much of the early evening hours of darkness at or near design capacity. Freeway B: This designates all other divided roadways with full control of access where lighting is needed. Roads serving long distance and mainly interurban movements. Includes motorways (urban or rural) and expressways (road which does not serve properties bordering on it and which is provided with separate carriageways for the two directions of traffic). Principal arterials may cross through urban areas, serving suburban movements. The traffic is characterized by high speeds and full or partial access control (interchanges or junctions controlled by traffic lights). Other roads leading to a principal arterial are connected to it through side collector roads. public road with dual carriageways and at least two lanes each way. All entrances and exits are signposted and all interchanges are grade separated. Central barrier or median present throughout the road. No crossing is permitted, while stopping is permitted only in an emergency. Restricted access to motor vehicles, prohibited to pedestrians, animals, pedal cycles, mopeds, agricultural vehicles. The minimum speed is not lower than 50 km/h [31 mph] and the maximum speed is not higher than 130 km/h [81 mph] (Except Germany where no speed limit is defined). Motorways are designed to carry heavy traffic at high speed with the lowest possible number of accidents. They are also designed to collect long-distance traffic from other roads, so that conflicts between long-distance traffic and local traffic are avoided. According to the common European definition, a motorway is defined as "a road, specially designed and built for motor traffic, which does not serve properties bordering on it, and which: (a) is provided, except at special points or temporarily, with separate carriageways for the two directions of traffic, separated from each other, either by a dividing strip not intended for traffic, or exceptionally by other means; (b) does not cross at level with any road, railway or tramway track, or footpath; (c) is specially sign-posted as a motorway and is reserved for specific categories of road motor vehicles. Urban motorways are also included in this definition. However, the respective national definitions and the type of roads covered may present slight differences in different EU countries. Historical map of the original A8-A9 motorway, Italy. The first motorway ever built in the world was opened on 21 September 1924. The first version of modern controlled-access highways evolved during the first half of the 20th century. The Long Island Motor Parkway on Long Island, New York, opened in 1908 as a private venture, was the world's first limited-access roadway. It included many modern features, including banked turns, guard rails and reinforced concrete tarmac. Modern controlled-access highways originated in the early 1920s in response to the rapidly increasing use of the automobile, the demand for faster movement between cities and as a consequence of improvements in paving processes, techniques and materials. These original high-speed roads were referred to as "dual highways" and, while divided, bore little resemblance to the highways of today. Opened in 1921, the AVUS in Berlin is the oldest controlled-access highway in Europe, although it was initially opened as a race track. The first dual highway opened in Italy in 1924, between Milan and Varese, and now forms parts of the A8 and A9 motorways. This highway, while divided, contained only one lane in each direction and no interchanges. Shortly thereafter, in New York in 1924, the Bronx River Parkway was opened to traffic. The Bronx River Parkway was the first road in North America to utilize a median strip to separate the opposing lanes, to be constructed through a park and where intersecting streets crossed over bridges. The Southern State Parkway opened in 1927, while the Long Island Motor Parkway was closed in 1937 and replaced by the Northern State Parkway (opened 1931) and the contiguous Grand Central Parkway (opened 1936). In Germany, construction of the Bonn-Cologne autobahn began in 1929 and was opened in 1932 by the mayor of Cologne. In Canada, the first precursor with semi-controlled access was The Middle Road between Hamilton and Toronto, which featured a median divider between opposing traffic flow, as well as the nations first cloverleaf interchange. This highway developed into the Queen Elizabeth Way, which featured a cloverleaf and trumpet interchange when it opened in 1937, and until the Second World War, boasted the longest illuminated stretch of roadway built. A decade later, the first section of Highway 401 was opened, based on earlier designs. It has since gone on to become the busiest highway in the world. The word freeway was first used in February 1930 by Edward M. Bassett. Bassett argued that roads should be classified into three basic types: highways, parkways, and freeways. In Bassett's zoning and property law-based system, abutting property owners have the rights of light, air and access to highways, but not parkways and freeways; the latter two are distinguished in that the purpose of a parkway is recreation, while the purpose of a freeway is movement. Thus, as originally conceived, a freeway is simply a strip of public land devoted to movement to which abutting property owners do not have rights of light, air or access. The A10 near Orléans, France showing hard shoulder and emergency telephone. The broken demarcation line for the hard shoulder is specific to France, and serves as a safety reference mark for drivers: the advisory distance from the vehicle ahead is two dashes minimum. Freeways, by definition, have no at-grade intersections with other roads, railroads or multi-use trails, and no traffic signal needed, hence "free of signal", but some Movable bridges, such as the Interstate Bridge on Interstate 5 between Oregon and Washington, do require drivers to stop for ship traffic. The crossing of freeways by other routes is typically achieved with grade separation either in the form of underpasses or overpasses. In addition to sidewalks (pavements) attached to roads that cross a freeway, specialized pedestrian footbridges or tunnels may also be provided. These structures enable pedestrians and cyclists to cross the freeway at that point without a detour to the nearest road crossing. Access to freeways is typically provided only at grade-separated interchanges, though lower-standard right-in/right-out (left-in/left-out in countries that drive on the left) access can be used for direct connections to side roads. In many cases, sophisticated interchanges allow for smooth, uninterrupted transitions between intersecting freeways and busy arterial roads. However, sometimes it is necessary to exit onto a surface road to transfer from one freeway to another. One example in the United States (notorious for the resulting congestion) is the connection from Interstate 70 to the Pennsylvania Turnpike (Interstate 70 and Interstate 76) through the town of Breezewood, Pennsylvania. Speed limits are generally higher on freeways and are occasionally nonexistent (as on much of Germany's Autobahn network). Because higher speeds reduce decision time, freeways are usually equipped with a larger number of guide signs than other roads, and the signs themselves are physically larger. Guide signs are often mounted on overpasses or overhead gantries so that drivers can see where each lane goes. Exit numbers are commonly derived from the exit's distance in miles or kilometers from the start of the freeway. In some areas, there are public rest areas or service areas on freeways, as well as emergency phones on the shoulder at regular intervals. In the United States, mileposts usually start at the southern or westernmost point on the freeway (either its terminus or the state line). California, Ohio and Nevada use postmile systems in which the markers indicate mileage through the state's individual counties. However, Nevada and Ohio also use the standard milepost system concurrently with their respective postmile systems. California numbers its exits off of its freeways according to a milepost system but does not use milepost markers. Two-lane freeways, often undivided, are sometimes built when traffic volumes are low or right-of-way is limited; they may be designed for easy conversion to one side of a four-lane freeway. (Most of the Bert T. Combs Mountain Parkway in Eastern Kentucky is two lanes, but work has begun to make all of it four-lane.) These are often called Super two roads. Several such roads are infamous for a high rate of lethal crashes; an outcome because they were designed for short sight distances (sufficient for freeways without oncoming traffic, but insufficient for the years in service as two-lane road with oncoming traffic). An example of such a "Highway to Hell" was European route E4 from Gävle to Axmartavlan, Sweden. The high rate of crashes with severe personal injuries on that (and similar) roads did not cease until a median crash barrier was installed, transforming the fatal crashes into non-fatal crashes. Otherwise, freeways typically have at least two lanes in each direction; some busy ones can have as many as 16 or more lanes[a] in total. In San Diego, California, Interstate 5 has a similar system of express and local lanes for a maximum width of 21 lanes on a 3.2-kilometre (2 mi) segment between Interstate 805 and California State Route 56. In Mississauga, Ontario, Highway 401 uses collector-express lanes for a total of 18 lanes through its intersection with Highway 403/Highway 410 and Highway 427. These wide freeways may use separate collector and express lanes to separate through traffic from local traffic, or special high-occupancy vehicle lanes, either as a special restriction on the innermost lane or a separate roadway, to encourage carpooling. These HOV lanes, or roadways open to all traffic, can be reversible lanes, providing more capacity in the direction of heavy traffic, and reversing direction before traffic switches. Sometimes a collector/distributor road, a shorter version of a local lane, shifts weaving between closely spaced interchanges to a separate roadway or altogether eliminates it. In some parts of the world, notably parts of the US, frontage roads form an integral part of the freeway system. These parallel surface roads provide a transition between high-speed "through" traffic and local traffic. Frequent slip-ramps provide access between the freeway and the frontage road, which in turn provides direct access to local roads and businesses. Except on some two-lane freeways (and very rarely on wider freeways), a median separates the opposite directions of traffic. This strip may be as simple as a grassy area, or may include a crash barrier such as a "Jersey barrier" or an "Ontario Tall Wall" to prevent head-on collisions. On some freeways, the two carriageways are built on different alignments; this may be done to make use of available corridors in a mountainous area or to provide narrower corridors through dense urban areas. Control of access relates to a legal status which limits the types of vehicles that can use a highway, as well as a road design that limits the points at which they can access it. Freeways are usually limited to motor vehicles of a minimum power or weight; signs may prohibit cyclists, pedestrians and equestrians and impose a minimum speed. It is possible for non-motorized traffic to use facilities within the same right-of-way, such as sidewalks constructed along freeway-standard bridges and multi-use paths next to freeways such as the Suncoast Trail along the Suncoast Parkway in Florida. De Lucht Rest Area on the Dutch A2 - A typical rest area in the Netherlands with services (fuel, refreshments and toilets). The only access is via the highway that it serves. In some US jurisdictions, especially where freeways replace existing roads, non-motorized access on freeways is permitted. Different states of the United States have different laws. Cycling on freeways in Arizona may be prohibited only where there is an alternative route judged equal or better for cycling. Wyoming, the least populated state, allows cycling on all freeways. Oregon allows bicycles except on specific urban freeways in Portland and Medford. In countries such as the United Kingdom new motorways require an Act of Parliament to ensure restricted right of way. Since upgrading an existing road (the "Queen's Highway") to a full motorway will result in extinguishing the right of access of certain groups such as pedestrians, cyclists and slow-moving traffic, many controlled access roads are not full motorways. In some cases motorways are linked by short stretches of road where alternative rights of way are not practicable such as the Dartford Crossing (the furthest downstream public crossing of the River Thames) or where it was not economic to build a motorway alongside the existing road such as the former Cumberland Gap. The A1 is a good example of piece-wise upgrading to motorway standard—as of January 2013, the 639-kilometre-long (397 mi) route had five stretches of motorway (designated as A1(M)), reducing to four stretches in March 2018 with completion of the A1(M) through North Yorkshire. Continental European non-motorway dual carriageways typically have limits set at 110–130 km/h (68–81 mph) for passenger cars. Research shows 85 percent of motor vehicle-bicycle crashes follow turning or crossing at intersections. Freeway travel eliminates almost all those conflicts save at entrance and exit ramps—which, at least on those freeways where cycling has not been banned, have sufficient room and sight for cyclists and motorists. An analysis of crashes in Arizona showed no safety problems with cycling on freeways. Fewer than one motor vehicle-bicycle crash a year was recorded on nearly 3,200 shoulder kilometres (2,000 mi) open to cyclists in Arizona. Major arterial roads will often have partial access control, meaning that side roads will intersect the main road at grade, instead of using interchanges, but driveways may not connect directly to the main road, and drivers must use intersecting roads to access adjacent land. At arterial junctions with relatively quiet side roads, traffic is controlled mainly by two-way stop signs which do not impose significant interruptions on traffic using the main highway. Roundabouts are often used at busier intersections in Europe because they help minimize interruptions in flow, while traffic signals that create greater interference with traffic are still preferred in North America. There may be occasional interchanges with other major arterial roads. Examples include US 23 between SR 15's eastern terminus and Delaware, Ohio, along with SR 15 between its eastern terminus and I-75, US 30, SR 29/US 33, and US 35 in western and central Ohio. This type of road is sometimes called an expressway. The most frequent way freeways are laid out is usually by building them from the ground up after things such as forestry or buildings are cleared away. Sometimes they deplete farmland, but other methods have been developed for economic, social and even environmental reasons. Full freeways are sometimes made by converting at-grade expressways or by replacing at-grade intersections with overpasses; however, any at-grade intersection that ends a freeway remains. Often, when there is a two-lane undivided freeway or expressway, it is converted by constructing a twin corridor on the side by leaving a median between the two travel directions. The opposing side for the old two-way corridor becomes a passing lane. Other techniques involve building a new carriageway on the side of a divided highway that has a lot of private access on one side and sometimes has long driveways on the other side since an easement for widening comes into place, especially in rural areas. The Belgrade Urban Motorway, constructed between 1970-1977, required demolitions of streets and houses, characteristical of urban motorways. In Novi Beograd, the motorway path was already laid out, requiring no demolitions. When a "third" carriageway is added, sometimes it can shift a directional carriageway by 50–200 feet (15–61 m) (or maybe more depending on land availability) as a way to retain private access on one side that favors over the other. Other methods involve constructing a service drive that shortens the long driveways (typically by less than 100 metres (330 ft)). An interchange or a junction is a highway layout that permits traffic from one controlled-access highway to access another and vice versa, whereas an access point is a highway layout where traffic from a distributor or local road can join a controlled-access highway. Some countries, such as the United Kingdom, do not distinguish between the two, but others make a distinction; for example, Germany uses the word Kreuz ("cross") for the former and Ausfahrt ("exit") for the latter. In all cases one road crosses the other via a bridge or a tunnel, as opposed to an at-grade crossing. The inter-connecting roads, or slip-roads, which link the two roads, can follow any one of a number of patterns. The actual pattern is determined by a number of factors including local topology, traffic density, land cost, building costs, type of road, etc. In some jurisdictions feeder/distributor lanes are common, especially for cloverleaf interchanges; in others, such as the United Kingdom, where the roundabout interchange is common, feeder/distributor lanes are seldom seen. There are many differences between countries in their geography, economy, traffic growth, highway system size, degree of urbanization and motorization, etc. ; all of which need to be taken into consideration when comparisons are made. According to some EU papers, safety progress on motorways is the result of several changes, including infrastructure safety and road user behavior (speed or seat belt use), while others matters such as vehicle safety and mobility patterns have a not quantified impact. The German autobahn network illustrates the safety trade-offs of controlled access highways. The injury crash rate is very low on autobahns while 22 people died per 1000 injury crashes—although autobahns have a lower rate than the 29 deaths per 1,000 injury accidents on conventional rural roads, the rate is higher than the risk on urban roads. Speeds are higher on rural roads and autobahns than urban roads, increasing the severity potential of a crash. According to ESTC, German motorways without a speed limit, but with a 130 km/h (81 mph) speed recommendation, are three times more deadly than motorways with a speed limit. Germany also introduced some 130 km/h (81 mph) speed limits on various motorway sections which were not limited. This generated a reduction in deaths in a range from 20% to 50% on those sections. Speed, in Europe, is considered to be one of the main contributory factors to collisions. Some countries, such as France and Switzerland, have achieved a death reduction by a better monitoring of speed. Tools used for monitoring speed might be increase in traffic density, improved speed enforcement and stricter regulation leading to driver license withdrawal, safety cameras, penalty point, and higher fines. Some other countries use automatic time over distance cameras (also known as section controls) to manage speed. Fatigue is considered as a risk factor more specific to monotonous roads such as motorways, although such data are not monitored/recorded in many countries. According to Vinci Autoroutes one third of accidents in French motorways are due to sleepy driving. In French motorways, 23% of people killed on motorways were not wearing seat belts, while 98% of front-seat passengers and 87% of rear-seat passenger wear seat belts. Although safety results do not change much from year to year, in Europe some changes have been observed: motorways fatalities decreased by 41% during the 2006–2015 decade, but increased by 10% between 2014 and 2015. However, EU has also data with motorway network length to reflect exposure. Those data show that fatalities by thousand kilometers have been halved between 2006 and 2015. A University of Barcelona study suggests that if tolls are implemented on a controlled-access highway, drivers may seek alternative routes to avoid paying the tolls. This may result in a decrease of safety on roads which are not designed for heavy traffic. In the United Kingdom, there are very few studies regarding the impact of road traffic accidents from existing and new urban motorways. In particular, new urban motorways do not grant a reduction of traffic accidents. In Italy, a study performed on urban motorway A56 Tangenziale di Napoli showed that reduction of speed leads to a decrease in accidents. for multiple vehicle accidents, the occupancy, and the time headway (for the middle lane). The 150-kilometre-long (93 mi) Marius network counts 292 injury accidents or fatalities for 1.5 billion of vehicle-kilometres, that is 189 injury accidents or fatalities for 1 billion of vehicle-kilometres. In 1994, it was assumed that lighting urban motorway would benefit from more safety than unlighted ones . it establishes that left lane collisions are more likely induced by volume effects, while right lane collisions are more closely tied to speed variances in adjacent lanes (In California, people drive the right lane). 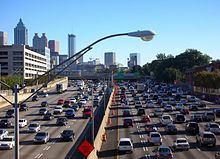 Traffic congestion, such as this on the Downtown Connector in Atlanta, is tied to photochemical smog. Highway lighting can have a negative influence on those living close to the freeway. High-mast lighting is an alternative as it concentrates the light on the road, but the tall structures can also have a NIMBY effect. Tunnel on A1 Motorway in Greece. Controlled-access highways have been constructed both between major cities as well as within them, leading to the sprawling suburban development found near most modern cities. Highways have been heavily criticized by environmentalists, urbanists, and preservationists for the noise, pollution, and economic shifts they bring. Additionally, they have been criticized by the driving public for the inefficiency with which they handle peak hour traffic. Often, rural highways open up vast areas to economic development and municipal services, generally raising property values. In contrast to this, above-grade highways in urban areas are often a source of lowered property values, contributing to urban decay. Even with overpasses and underpasses, neighbourhoods are divided—especially impoverished ones where residents are less likely to own a car, or to have the political and economic influence to resist construction efforts. Beginning in the early 1970s, the US Congress identified freeways and other urban highways as responsible for most of the noise exposure of the US population. Subsequently, computer models were developed to analyze freeway noise and aid in their design to help minimize noise exposure. Some cities have implemented freeway removal policies, under which freeways have been demolished and reclaimed as boulevards or parks, notably in Seoul (Cheonggyecheon), Portland (Harbor Drive), New York City (West Side Highway), Boston (Central Artery), San Francisco (Embarcadero Freeway) and Milwaukee (Park East Freeway). An alternative to surface or above ground freeway construction has been the construction of underground urban freeways using tunnelling technologies. This has been particularly employed in the Australian cities of Sydney (which has five such freeways), Brisbane (which has three), and Melbourne (which has two). This has had the benefit of not creating heavily trafficked surface roads and, in the case of Melbourne's Eastlink Motorway, prevented the destruction of an ecologically sensitive area. Other Australian cities face similar problems (lack of available land, cost of home acquisition, aesthetic problems and community opposition). Brisbane, which also has to contend with physical boundaries (the Brisbane River) and rapid population increases, has embraced underground freeways. There are currently three open to traffic (Clem Jones Tunnel (Clem7), Airport Link and Legacy Way) and one (East-West Link) is currently in planning. All of the tunnels are designed to act as an inner-city ring road or bypass system and include provision for public transport, whether underground or in reclaimed space on the surface. However, freeways are not beneficial for road-based public transport services, because the restricted access to the roadway means that it is awkward for passengers to get to the limited number of boarding points unless they drive to them, largely defeating the purpose. In Canada, the extension of Highway 401 into Detroit, known as the Herb Gray Parkway, has been designed with numerous tunnels and underpasses which provide land for parks and recreational uses. Freeway opponents have found that freeway expansion is often self-defeating: expansion simply generates more traffic. That is, even if traffic congestion is initially shifted from local streets to a new or widened freeway, people will begin to use their cars more and commute from more remote locations. Over time, the freeway and its environs become congested again as both the average number and distance of trips increases. This phenomenon is known as induced demand. Urban planning experts such as Drusilla Van Hengel, Joseph DiMento and Sherry Ryan argue that although properly designed and maintained freeways may be convenient and safe, at least in comparison to uncontrolled roads, they may not expand recreation, employment and education opportunities equally for different ethnic groups, or for people located in certain neighborhoods of any given city. Still, they may open new markets to some small businesses. Construction of urban freeways for the US Interstate Highway System, which began in the late 1950s, led to the demolition of thousands of city blocks, and the dislocation of many more thousands of people. The citizens of many inner city areas responded with the freeway and expressway revolts. Through the study of Washington's response, it can be shown that the most effective changes came not from executive or legislative action, but instead from policy implementation. One of the foremost rationales for the creation of the United States Department of Transportation (USDOT) was that an agency was needed to mediate between the conflicting interests of interstates and cities. Initially, these policies came as regulation of the state highway departments. Over time, USDOT officials re-focused highway building from a national level to the local scale. With this shift of perspective came an encouragement for alternative transportation, and locally based planning agencies. At present, freeway expansion has largely stalled in the United States, due to a multitude of factors that converged in the 1970s: higher due process requirements prior to taking of private property, increasing land values, increasing costs for construction materials, local opposition to new freeways in urban cores, the passage of the National Environmental Policy Act (which imposed the requirement that each new federally funded project must have an environmental impact statement or report) and falling gas tax revenues as a result of the nature of the flat-cent tax (it is not automatically adjusted for inflation), the tax revolt movement, and growing popular support for high-speed mass transit in lieu of new freeways. In England and Wales, the numbers of major motorways followed a numbering system separate to that of the A-road network, though based on the same principle of zones. Running clockwise from the M1 the zones were defined for Zones 1 to 4 based on the proposed M2, M3 and M4 motorways. The M5 and M6 numbers were reserved for the other two planned long distance motorways. 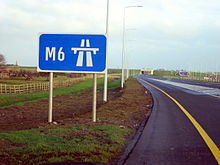 The Preston Bypass, the UK's first motorway, should have been numbered A6(M) under the scheme decided upon, but it was decided to keep the number M6 as had already been applied. A map Showing Future Pattern of Principal National Routes was issued by the Ministry of War Transport in 1946 shortly before the law that allowed roads to be restricted to specified classes of vehicle (the Special Roads Act 1949) was passed. 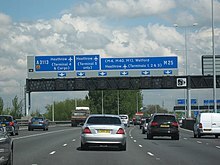 The first section of motorway, the M6 Preston Bypass, opened in 1958 followed by the first major section of motorway (the M1 between Crick and Berrygrove in Watford), which opened in 1959. From then until the 1980s, motorways opened at frequent intervals; by 1972 the first 1,600 kilometres (1,000 mi) of motorway had been built. Whilst roads outside of urban areas continued to be built throughout the 1970s, opposition to urban routes became more pronounced. Most notably, plans by the Greater London Council for a series of ringways were cancelled following extensive road protests and a rise in costs. In 1986 the single-ring, M25 motorway was completed as a compromise. In 1996 the total length of motorways reached 3,200 kilometres (2,000 mi). No traffic lights (except occasionally on slip roads before reaching the main carriageway). Exit is nearly always via a numbered junction and slip road, with rare minor exceptions. Pedestrians, cyclists and vehicles below a specified engine size are banned. the M271 in Southampton which has a roundabout on the main carriageway where it meets the M27, but then continues as the M271 after the junction. on the M60. This came about as a result of renumbering sections of the M62 and M66 motorways near Manchester as the M60, to form a ring around the city. What was formerly the junction between the M62 and M66 now involves the clockwise M60 negotiating a roundabout, while traffic for the eastbound M62 and northbound M66 carries straight on from the M60. This junction, known as Simister Island, has also been criticised for the presence of a roundabout and the numbered route turning off. the A1(M) between the M62 in North Yorkshire and Washington in Tyne and Wear is built to full 'M' class standards without any roundabouts. It has been suggested this section of the A1(M) should be made the northern extension of the M1. The Ax(M) format number is also planned to be used for the highest standard of a new classification of road referred to in England as "Expressways", basically roads normally without roundabouts or cross-central-reservation turns (i.e. right turns across the central reservation) and with graded junctions (. Such roads will have motorway-style restrictions but emergency reservations rather than standard major motorway-standard hard shoulders. In Scotland, where the Scottish Office (superseded by the Scottish Executive in 1999) rather than the Ministry of Transport and Civil Aviation had the decision, there is no zonal pattern, but rather the A-road rule is strictly enforced. It was decided to reserve the numbers 7, 8 and 9 for Scotland. The M8 follows the route of the A8, and the A90 became part of the M90 when the A90 was re-routed along the path of the A85. Most motorways follow an "M"-format with two exceptions. These are the A823(M) near Rosyth joining the A823 to the M90 and the A74(M) between the English M6 at Gretna and the M74 at Abingdon. In Northern Ireland a distinct numbering system is used, which is separate from the rest of the United Kingdom, though the classification of roads along the lines of A, B and C is universal throughout the UK and the Isle of Man. According to a written answer to a parliamentary question to the Northern Ireland Minister for Regional Development, there is no known reason as to how Northern Ireland's road numbering system was devised. 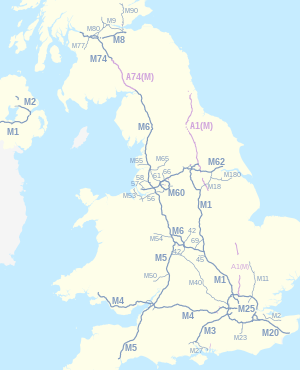 However motorways, as in the rest of the UK, are numbered M, with the two major motorways coming from Belfast being numbered M1 and M2. The M12 is a short spur of the M1 with the M22 being a short continuation (originally intended to be a spur) of the M2. There are two other motorways, the short M3, the M5 and a motorway section of the A8 road, known as the A8(M). Signage on the M6 near Kinnegad in Ireland. This is a standard sign in many European countries to indicate the start of motorway regulations. In this case the appropriate motorway number is shown and in accordance with Irish practice a continuous yellow line indicates a motorway rather than a high-quality dual carriageway (HQDC). In the Republic of Ireland, motorway and national road numbering is quite different from the UK convention. Since the passage of the Roads Act 1993, all motorways are part of, or form, national primary roads. These routes are numbered in series, (usually, radiating anti-clockwise from Dublin, starting with the N1/M1) using numbers from 1 to 33 (and, separately from the series, 50). 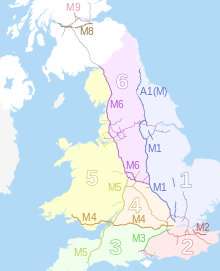 Motorways use the number of the route of which they form part, with an M prefix rather than N for national road (or in theory, rather than R for regional road). In most cases, the motorway has been built as a bypass of a road previously forming the national road (e.g. the M7 bypassing roads previously forming the N7)—the bypassed roads are reclassified as regional roads, although updated signposting may not be provided for some time, and adherence to signage colour conventions is lax (regional roads have black-on-white directional signage, national routes use white-on-green). Under the previous legislation, the Local Government (Roads and Motorways) Act 1974, motorways theoretically existed independently to national roads, however the short sections of motorway opened during this act, except for the M50, always took their number from the national road that they were bypassing. The older road was not downgraded at this point (indeed, regional roads were not legislated for at this stage). Older signage at certain junctions on the M7 and M11 can be seen reflecting this earlier scheme, where for example N11 and M11 can be seen coexisting. The M50, an entirely new national road, is an exception to the normal inheritance process, as it does not replace a road previously carrying an N number. The M50 was nevertheless legislated in 1994 as the N50 route (it had only a short section of non-motorway section from the Junction 11 Tallaght to Junction 12 Firhouse until its extension as the Southern Cross Motorway). The M50's designation was chosen as a recognisable number. As of 2010, the N34 is the next unused national primary road designation. In theory, a motorway in Ireland could form part of a regional road. In Hungary, similar to Ireland, motorway numbers can be derived from the original national highway numbers (1–7), with an M prefix attached, e.g. M7 is on the route of the old Highway 7 from Budapest towards Lake Balaton and Croatia. New motorways not following the original Budapest-centred radial highway system get numbers M8, M9, etc., or M0 in the case of the ring road around Budapest. 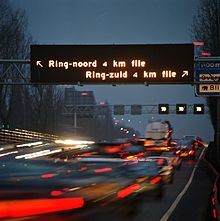 Also in the Netherlands, motorway numbers can be derived from the original national highway numbers, but with an A (Autosnelweg) prefix attached, like A9. In Germany federal motorways have the prefix A (Autobahn). If the following number is an odd number the motorway generally follows a north–south direction, even-numbered motorways generally follow an east–west direction. Other controlled-access (dual carriageways) in Germany can be federal highways (Bundesstraßen), state highways (Landesstraßen), district highways (Kreisstraßen) and city highways (Stadtstraßen), each with their own numbering system. In New Zealand, as well as in the Scandinavian countries, in Finland, Brazil and Russia, motorway numbers are also derived from the state highway route that they form a part of, but unlike Hungary and Ireland, they are not distinguished from non motorway sections of the same state highway route. In the cases where a new motorway acts as a bypass of a state highway route, the original state highway is either stripped of that status or renumbered. A low road number means a road suitable for long distance driving. 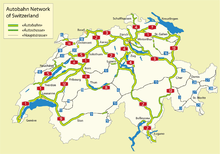 In Switzerland as of April 2011, there are 1,763.6 kilometres (1,095.9 mi) of a planned 1,893.5 kilometres (1,176.6 mi) of motorway completed. The country is mountainous with a high proportion of tunnels, there are 220 totaling 200 kilometres (120 mi), which is over 12% of the total motorway length. In Australia, motorway numbering varies from state to state. Currently most states are adopting numbering systems with the prefix M for motorways. In Belgium, motorways but also some dual carriageways have numbers preceded by an A. However, those that also have an E-number are generally referenced with that one. City ring and bypasses have numbers preceded by an R, these also can be either motorways or dual carriageways. While the design characteristics listed above are generally applicable around the globe, every jurisdiction provides its own specifications and design criteria for controlled-access highways. The motorways and expressways of Morocco are a network of multiple-lane, high-speed, controlled-access highways in Morocco. As of November 2016 the total length of Morocco's motorways is 1,785 kilometres (1,109 mi) and 1,600 kilometres (990 mi) expressways. Morocco plans to expand the road network. In the country 3,400 kilometres (2,100 mi) of motorways and 2,100 kilometres (1,300 mi) of expressways are currently under construction in different parts of the country. In the year 2035 the total length of the motorways will be 5,185 kilometres (3,222 mi) of motorways and 3,700 kilometres (2,300 mi) of expressways. According to the minister of Morocco, this plan also includes a program specific to rural roads for the construction of 30,000 kilometres (19,000 mi) of roads for an investment of 30 billion dirhams. Drivers may not use hand signals on a freeway (except in emergencies) and the minimum speed on a freeway is 60 km/h (37 mph). Drivers in the rightmost lane of multi-carriageway freeways must move to the left if a faster vehicle approaches from behind to overtake. Despite popular opinion that "freeway" means a road with at least two carriageways, single carriageway freeways exist, as is evidenced by the statement that "the roads include 1,400 km [870 mi] of dual carriageway freeway, 440 km [270 mi] of single carriageway freeway and 5,300 km [3,300 mi] of single carriage main road with unlimited access." Although some 11,000 kilometres (6,800 mi) of Brazilian highway is built to motorway-standard, there is no distinct designation for controlled-access highways in the Brazilian federal and state highway systems. The term autoestrada (Portuguese for "motorway") is not commonly used in Brazil; the terms estrada ("road") and especially rodovia ("highway") are instead preferred. Nevertheless, the most technically advanced motorways in Brazil are defined Class 0 motorways by the National Department of Transport Infrastructure (DNIT). These motorways are built to safely allow for vehicular speeds of up to 130 km/h (81 mph)). In mountainous terrain, the maximum allowable gradient is 5% and minimum allowable radius of curvature is 665 metres (2,182 ft) (with 12% super-elevation). São Paulo state, with 4,700 kilometres (2,900 mi) of motorway, has the most in the country. It is also the state with more highways conceded to the private sector, resulting in the highest value of toll fares per kilometer of highway. Brazil's first motorway, the Rodovia Anhanguera, was completed in 1953 as an upgrade of the earlier single-carriageway highway. That same year, construction of the second carriageway of Rodovia Anchieta began. Motorway construction, most projects in the form of upgrades of older single-carriageway highways, quickened in the following decades. The current Class 0 motorways include: Rodovia dos Bandeirantes, Rodovia dos Imigrantes, Rodovia Castelo Branco, Rodovia Ayrton Senna/Carvalho Pinto, Rodovia Osvaldo Aranha (also known as "Free-way") and São Paulo's Metropolitan Beltway Rodoanel Mario Covas – all modern, post-1970s highways meeting modern European standards. Other stretches of highway such as the under-construction south BR-101 and Rodovia Régis Bittencourt are of older design standards. Canada has no current national system for controlled-access highways. All controlled-access freeways, including sections that form part of the Trans Canada Highway, are under provincial jurisdiction, and have no numeric continuation across provincial boundaries. The largest networks in the country are in Ontario (400-series highways) and Quebec (Autoroutes of Quebec). These roads are influenced by, and have influenced, US standards, but have design innovations and differences. The total length of dual-carriageways with controlled access in Canada is 6,350 kilometres (3,950 mi), of which 564 kilometres (350 mi) are in British Columbia, 642 kilometres (399 mi) in Alberta, 59 kilometres (37 mi) in Saskatchewan, 2,135 kilometres (1,327 mi) in Ontario, 1,941 kilometres (1,206 mi) in Quebec, and 1,000 kilometres (620 mi) in the Maritimes. The RN-21 (East–West, Boulevard Monseñor Romero), is the very first freeway to be built in El Salvador and in Central America. The freeway passes the northern area of the city of Santa Tecla, La Libertad. It has a small portion serving Antiguo Cuscatlán, La Libertad, and merges with the RN-5 (East–West, Boulevard de Los Proceres/Autopista del Aeropuerto) in San Salvador. The total length of the RN-21 is 9.35 km (5.81 mi) and is currently working as a traffic reliever in the metropolitan area. The RN-21 was named in honor of the first mayor of San Salvador, Diego de Holguín, due to political reasons it was renamed Boulevard Monseñor Romero, in honor of Óscar Romero. The first phase of the highway was completed in 2009, and the second phase was completed and opened in November 2012. In the United States, a freeway is defined by the federal government's Manual on Uniform Traffic Control Devices as a divided highway with full control of access. This means two things: first, adjoining property owners do not have a legal right of access, meaning all existing driveways must be removed and access to adjacent private lands must be blocked with fences or walls; instead, frontage roads provide access to properties adjacent to a freeway in many places. Second, traffic on a freeway is "free-flowing". All cross-traffic (and left-turning traffic) is relegated to overpasses or underpasses, so that there are no traffic conflicts on the main line of the highway, which must be regulated by traffic lights, stop signs, or other traffic control devices. Achieving such free flow requires the construction of many overpasses, underpasses, and ramp systems. The advantage of grade-separated interchanges is that freeway drivers can almost always maintain their speed at junctions since they do not need to yield to vehicles crossing perpendicular to mainline traffic. In contrast, an expressway is defined as a divided highway with partial control of access. Expressways may have driveways and at-grade intersections, though these are usually less numerous than on ordinary arterial roads. This distinction was apparently first developed in 1949 by the Special Committee on Nomenclature of what is now the American Association of State Highway and Transportation Officials. Prior to that distinction the first freeways were complete in 1940, the Pennsylvania Turnpike, and Arroyo Seco Parkway. In turn, the definitions were incorporated into AASHTO's official standards book, the Manual on Uniform Traffic Control Devices, which would become the national standards book of USDOT under a 1966 federal statute. The same distinction has also been codified into the statutory law of eight states: California, Minnesota, Mississippi, Missouri, Nebraska, North Dakota, Ohio, and Wisconsin. However, each state codified the federal distinction slightly differently. California expressways do not necessarily have to be divided, though they must have at least partial access control. For both terms to apply, in Wisconsin, a divided highway must be at least four lanes wide; and in Missouri, both terms apply only to divided highways at least 16 kilometres (10 mi) long that are not part of the Interstate Highway System. In North Dakota and Mississippi, expressways may have "full or partial" access control and "generally" have grade separations at intersections; a freeway is then defined as an expressway with full access control. Ohio's statute is similar, but instead of the vague word generally, it imposes a requirement that 50% of an expressway's intersections must be grade-separated for the term to apply. Only Minnesota enacted the exact MUTCD definitions, in May 2008. The term expressway is also used for what the federal government calls "freeways". Where the terms are distinguished, freeways can be characterized as expressways upgraded to full access control, while not all expressways are freeways. Examples in the United States of roads that are technically expressways (under the federal definition), but contain the word "freeway" in their names: State Fair Freeway in Kansas, Chino Valley Freeway in California, Rockaway Freeway in New York, and Shenango Valley Freeway (a portion of US 62) in Pennsylvania. 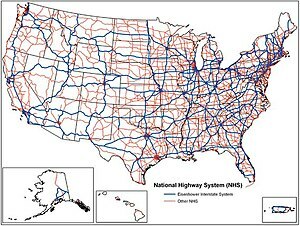 Unlike in some jurisdictions, not all freeways in the US are part of a single national freeway network (although together with non-freeways, they form the National Highway System). For example, many state highways such as California State Route 99 have significant freeway sections. Many sections of the older United States Numbered Highways network have been upgraded to freeways but have kept their existing US Highway numbers. A number of the United Kingdom's overseas territories have controlled-access highways, including the Turks and Caicos Islands and Cayman Islands. The National Trunk Highway System (NTHS, Chinese: 中国国家高速公路网, literally "National Expressway Network") expressway network of the People's Republic of China is the longest in the world. The total length of China's expressways was 111,950 kilometres (69,560 mi) by the end of 2014. Only in 2012, 12,409 kilometres (7,711 mi) of expressways were added to this network. Expressways in China are a fairly recent addition to a complicated network of roads. According to Chinese government sources, China did not have any expressways before 1988. One of the earliest expressways nationwide was the Jingshi Expressway between Beijing and Shijiazhuang in Hebei province. This expressway now forms part of the Jingzhu Expressway, currently one of the longest expressways nationwide at over 2,000 kilometres (1,200 mi). In Hong Kong major motorways are numbered from 1 to 10 in addition to their names. Speed limits on expressways typically range from 70 to 110 km/h (43 to 68 mph). Expressways(known as "Gatimarg/गतिमार्ग", or "Speedways" in Hindi and other Indian languages) are the highest class of roads in India's road network and make up around 1,500 kilometres (930 mi) of the National Highway System. They have a minimum of six or eight-lane controlled-access highways where entrance and exit is controlled by the use of slip roads. India has seen a surge of rapid expansion and modernisation of its road network, consisting of State Highways, National Highways and Expressways, under successive Governments. As of 2015, approximately 1,712.4 kilometres (1,064.0 mi) of expressways are operational in India. Currently, the National Highways Development Project(NHDP) aims to expand the highway network and plans to add an additional 18,637 km (11,580 mi) of expressways by the year 2022. The Expressways are operated and maintained by the Union, through the National Highways Authority of India. In 2009, the Government of India proposed the National Expressways Authority of India(NEAI) to be a body, operating under the Ministry of Road Transport and Highways which will be in charge of the construction and maintenance of expressways. The Ministry is in the process of preparing a draft for creation of a National Expressways Authority of India (NEAI) on the lines of the National Highways Authority of India (NHAI). 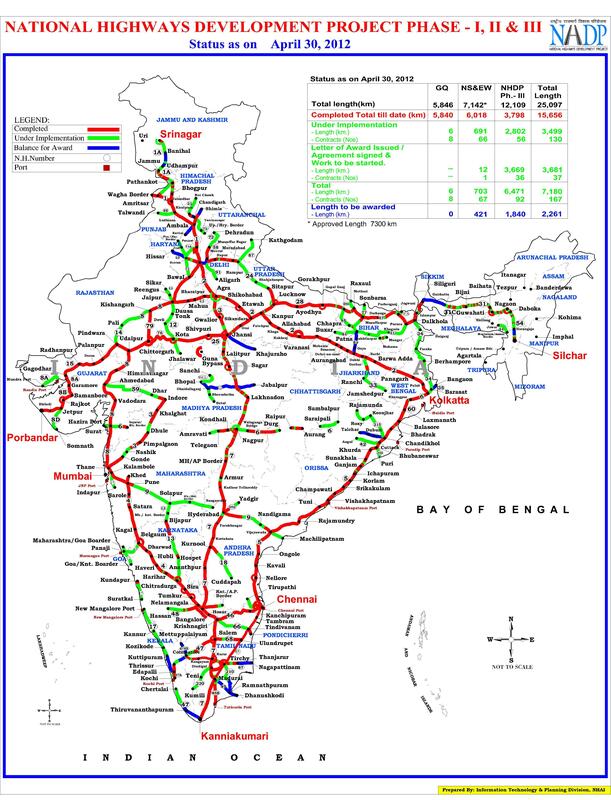 In July 2017, The Ministry of Road Transport and Highways proposed a greenfield access-controlled expressways network across India. Study was conducted on identifying stretches on which new expressways can be constructed. But, as of now no further action has been taken on the National Expressways Network report. In Indonesia, an expressway is better known as a toll road simply the translation from Jalan Tol in Bahasa Indonesia. Indonesia has 1,710 kilometres (1,060 mi) expressway length so far, almost 70% of its expressways are in Java island. In 2009, the Indonesian government had planned to expand more expressway network in Java island by connecting Merak to Banyuwangi which is the total length of Trans-Java toll road including the Java big cities expressway such as Jakarta, Surabaya, Bandung and its complements is more than 1,000 kilometres (620 mi). The Indonesian government also had planned to build the Trans-Sumatra toll road that connects Banda Aceh to Bakauheni along 2,700 kilometres (1,700 mi). In 2012, the government allocated 150 trillion rupiah for the construction of the toll roads. There are three stages of construction of Trans-Sumatra toll road which is expected to be connected together in 2025. The other islands in Indonesia such as Kalimantan, Sulawesi also has begun constructed its expressways including connecting Manado to Makassar in Sulawesi and also Pontianak to Balikpapan in Kalimantan. However, there are still no plans to build an expressway in Western New Guinea due to its slow population growth. Indonesia is expected to have at least 7,000 kilometres (4,300 mi) of expressway in 2030. Indonesia doesn't acknowledge or observe any highway numbering. The history of freeways in Iran goes back to before the Iranian Revolution. The first freeway in Iran was built at that time, between Tehran and Karaj with additional construction and the studies of many other freeways started as well. Today Iran has about 2,160 kilometres (1,340 mi) of freeway. Controlled-access highways in Israel are designated by a blue colour. Blue highways are completely grade-separated but may include bus stops and other elements that may slow down traffic on the right lane. National expressways (高速自動車国道, Kōsoku Jidōsha Kokudō), generally known as 高速道路 (Kōsoku Dōro), make up the majority of controlled-access highways in Japan. The network boasts an uninterrupted link between Aomori Prefecture at the northern part of Honshū and Kagoshima Prefecture at the southern part of Kyūshū, linking Shikoku as well. Additional expressways serve travellers in Hokkaidō and on Okinawa Island, although those are not connected to the Honshū-Kyūshū-Shikoku grid. Expressways have a combined length of 9,341 kilometres (5,804 mi) as of April 2017[update]. Many Japanese expressways go through the steep mountains. A group of green-colored directional signs on a Japanese expressway. Toll gates are placed at most of the entrances and exits of Japanese expressways. Aerial view of Toyota Interchange, connecting Tomei Expressway and Shin-Tomei Expressway. The Shutoko C1 route forms a loop of the center of Tokyo. Since Gyeongin Expressway linking Seoul and Incheon opened in 1968, national expressway system in South Korea has been expanded into 36 routes, with total length of 4,481 kilometres (2,784 mi) as of 2017. 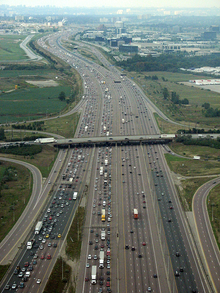 Most of expressways are four-lane roads, while 1,030 kilometres (640 mi) (26%) have six to ten lanes. Speed limit is typically 100 km/h (62 mph) for routes with four or more lanes, while some sections having fewer curves have limit of 110 km/h (68 mph). Expressways in South Korea were originally numbered in order of construction. Since 24 August 2001, they have been numbered in a scheme somewhat similar to that of the Interstate Highway System in the United States. Furthermore, the symbols of the South Korean highways are similar to the US red, white and blue. Arterial routes are designated by two-digit numbers, with north-south routes having odd numbers, and east-west routes having even numbers. Primary routes (i.e. major thoroughfares) have 5 or 0 as their last digit, while secondary routes end in other digits. Branch routes have three-digit route numbers, where the first two digits match the route number of an arterial route. This differs from the American system, whose last two digits match the primary route. Belt lines have three-digit route numbers where the first digit matches the respective city's postal code. This also differs from American numbering. Route numbers in the range 70–99 are not used in South Korea; they are reserved for designations in the event of Korean reunification. The Gyeongbu Expressway kept its Route 1 designation, as it is South Korea's first and most important expressway. The Malaysian Expressway System (Malay: Sistem Lebuhraya Malaysia), which begins with the North–South Expressway (NSE), is currently in the process of being substantially developed. These expressways are built by private companies under the supervision of the government highway authority, Malaysian Highway Authority. The expressway network of Malaysia is considered the best expressway network in Southeast Asia and also in Asia after China and Japan and also the fifth in the world. [by whom?] They were 30 expressways in the country and the total length is 1,821 kilometres (1,132 mi). and another 219.3 kilometres (136.3 mi) is still under construction. The closed toll expressway system is similar to the Japanese Expressway System and Chinese Expressway System. All Malaysian toll expressways are controlled-access highway and managed in the Build-Operate-Transfer (BOT) system. Malaysian expressways exist in both West Malaysia and East Malaysia, however, the former are better-connected. The North–South Expressway passes through all the major cities and conurbations in West Malaysia, such as Penang, Ipoh, the Klang Valley and Johor Bahru. The Pan Borneo Highway connects the Malaysian states of Sabah and Sarawak with Brunei. The motorways of Pakistan and expressways of Pakistan are a network of multiple-lane, high-speed, limited-access or controlled-access highways in Pakistan, which are owned, maintained and operated federally by Pakistan's National Highway Authority. The total length of Pakistan's motorways and expressways is 1,670 kilometres (1,040 mi) as of November 2016. Around 3,690 kilometres (2,290 mi) of motorways are currently under construction in different parts of the country. Most of these motorway projects will be complete between 2018 and 2020. Pakistan's motorways are part of Pakistan's National Trade Corridor project that aims to link Pakistan's three Arabian Sea ports of Karachi, Port Qasim and Gwadar to the rest of the country. These would further link with Central Asia and China, as proposed in the China Pakistan Economic Corridor. Pakistan's first motorway, the M2, was inaugurated in November 1997; it is a 367-kilometre-long (228 mi), six-lane motorway that links Pakistan's federal capital, Islamabad, with Punjab's provincial capital, Lahore. Other completed motorways and expressways are M1 Peshawar–Islamabad Motorway, M3 Pindi–Faislabad Motorway, E13 Islamabad≠–Murree–Kashmir Expressway, M4 Faisalabad–Multan Motorway, M8 Ratadero–Gawader Motorway, E8 Islamabad Expressway and few others. Full control-access highways in the Philippines are referred to as expressways, which are usually toll roads. The expressway network is concentrated in Luzon, with the North Luzon Expressway and South Luzon Expressway being the most important ones. The expressway network in Luzon do not form a network, but there are ongoing construction to interconnect those highways as well as to decongest the existing roads in the areas they serve. Expressways are being introduced to Visayas and Mindanao through the construction of the Cebu–Cordova Link Expressway in Metro Cebu and Davao City Expressway in Davao City. The expressways of Singapore are special roads that allow motorists to travel quickly from one urban area to another. All of them are dual carriageways with grade-separated access. They usually have three to four lanes in each direction, although there are two-lane carriageways at many expressway—expressway intersections and five-lane carriageways in some places. There are ten expressways, including the new Marina Coastal Expressway. Studies about the feasibility of additional expressways are ongoing. Construction on the first expressway, the Pan Island Expressway, started in 1966. As of 2014[update], there are 163 kilometres (101 mi) of expressways in Singapore. The Singaporean expressway networks are connected with Malaysian expressway networks via Ayer Rajah Expressway (connects with the Second Link Expressway via the Malaysia–Singapore Second Link) and Bukit Timah Expressway (connects with the Eastern Dispersal Link via the Johor–Singapore Causeway). Sri Lanka currently has over 150 kilometres (93 mi) of designated expressways serving the southern part of the country. The first stage of the E01 Expressway (Southern Expressway) which opened in 2011 was Sri Lanka's first expressway spanning a distance of 95.3 kilometres (59.2 mi). The second stage of the Southern Expressway opened in 2014 and extends to Matara. The E03 Expressway (Colombo–Katunayake Expressway) opened in 2013 and connects Sri Lanka's largest city Colombo with the Bandaranaike International Airport covering a distance of 25.8 kilometres (16.0 mi). All E-Grade highways in Sri Lanka are access controlled, toll roads with speeds limits in the range of 80–110 km/h (50–68 mph). The network is to be expanded to 350 kilometres (220 mi) by 2019. Taiwan has an extensive road network that includes two types of controlled-access highway: freeways and expressways. Only cars and trucks are allowed onto freeways, the first of which — Freeway 1 — was completed in 1974. Expressways allow car and truck traffic as well as motorcycles with engines of 250cc or more. Expressways in Taiwan may be controlled-access highways similar to National Freeways or limited-access roads. Most have urban roads and intra-city expressways (as opposed to Highway system) status, although some are built and maintained by cities. 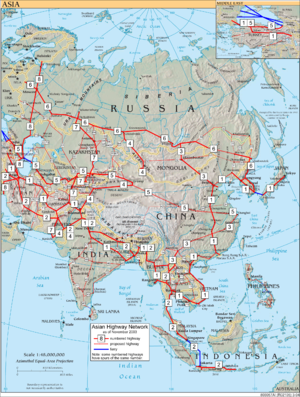 The Thai motorway network is an intercity motorway network that spans 145 kilometres (90 mi). It is to be extended to over 4,000 kilometres (2,500 mi) according to the master plan. Thailand's motorway network is considered to be separate from Thailand's expressway network, which is the system of usually elevated expressways within Greater Bangkok. Thailand also has a provincial highway network. The Thai highway network spans over 70,000 kilometres (43,000 mi) across all regions of Thailand. These highways, however, are often dual carriageways with frequent u-turn lanes and intersections slowing down traffic. Coupled with the increase in the number of vehicles and the demand for a limited-access motorway, the Thai Government issued a Cabinet resolution in 1997 detailing the motorway construction master plan. Some upgraded sections of highway are being turned into a "motorway", while other motorways are being purpose-built. At present, the expressway system of Vietnam is 895 km long. Under the government's plan, the national expressway system will have a length of 6411 km. The expressway system in Vietnam is separated from the national highway system. Most of the expressways are located in the North, especially around Hanoi. Of the 21 expressways in Vietnam, 8 depart from Hanoi and 14 in the north, with a length of 1368 km. The first motorway in Vietnam is the Phap Van - Cau Gie expressway, which is inaugurated on 1 January 2002. Currently, most of the expressways in Vietnam are 4 lanes, some routes as Ha Noi - Hai Phong, or Phap Van - Cau Gie is 6 lanes. The only elevated expressway in Vietnam is Mai Dich - Thanh Tri Bridge (also known as the third ring road in Hanoi). The cost of building Vietnam's highways is one of the most expensive in the world, with an average cost of $ 12 million per km. Compared with China, where there are similarities, their highway costs are only $ 5 million, the US and European countries are $ 3-4 million per kilometer. According to Road traffic law of Vietnam, expressway is a road for motor vehicles, with dividers dividing the road for two separate vehicles; do not cross the same level with one or other line; Fully equipped facilities to ensure continuous traffic, safety, shorten the journey time and only car out, at certain points. Although roads are under the responsibility of each individual state, including within the European Union, there are some legal conventions (international treaties) and some European directives which give a legal framework for roads of a European importance with the goal to introduce some kind of homogenization between various members. They basically consider, at European level, three types of roads: motorways, express roads, and ordinary roads. Some European treaties also define aspects such as the range of speed limit, or for some geometric aspects of roads, in particularly for the International E-road network. A motorway is a road specially designed and built for motor vehicle traffic, which does not directly provide access to the properties bordering on it. the use of special signposting to indicate the road as a motorway and to exclude specific categories of road vehicles and/ or road users. In determining the extent of a motorway its entry and exit lanes are included irrespective of the location of the motorway signposts. Urban motorways are also included in this term. Motorways status is signaled at the entry and exit of the motorway by a symbol conforming to international agreements, but specific to each country. The peripheral northern and eastern regions of the EU have a lower density motorway network. Within the European Union, there are 26 regions (NUTS level 2) with no motorway network in 2013. Those regions are islands or remote regions, for instance four overseas French regions and Corsica. The Baltic member state of Latvia, as well as four regions from Poland, and two regions from each of Bulgaria and Romania also reported no motorway network; several of these regions bordered onto non-member neighbouring countries to the east of the EU. Highways in Albania form part of the recent Albanian road system. Following the collapse of communism in 1991, the first highways in Albania started being constructed, The first was SH2, connecting Tirane with Durrës via Vora. Since the 2000s, main roadways have drastically improved, though lacking standards in design and road safety. This involved the construction of new roadways and the putting of contemporary signs. However, some state roads continue to deteriorate from lack of maintenance while others remain unfinished. A1 Nation's Highway in Northern Albania connecting Albania with Kosovo. The Austrian autobahns (German: Autobahnen) are controlled-access highways in Austria. They are officially called Bundesstraßen A (Bundesautobahnen) under the authority of the Federal Government according to the Austrian Federal Road Act (Bundesstraßengesetz), not to be confused with the former Bundesstraßen highways maintained by the Austrian states since 2002. Austria currently has 18 Autobahnen, since 1982 built and maintained by the self-financed ASFiNAG stock company in Vienna, which is wholly owned by the Austrian republic and earns revenue from road-user charges and tolls. Each route bears a number as well as an official name with local reference, which however is not displayed on road signs. 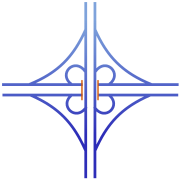 Unusually for European countries, interchanges (between motorways called Knoten, "knots") are numbered by distance in kilometres starting from where the route begins; this arrangement is also used in the Czech Republic, Slovakia, Hungary, Spain, and most provinces of Canada (and in most American states, albeit in miles). 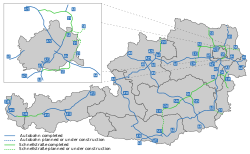 The current Austrian Autobahn network has a total length of 1,720 kilometres (1,070 mi). In 1937, the first motorway between Brussels and Ostend was completed, following the example of neighboring countries such as Germany. It mainly served local industries and tourism as a connection between the capital city and a coastal region. However, the Second World War and the reparation of the complete road network after the war caused a serious delay in the creation of other motorways. In 1949, the first plans were made to build a complete motorway network of 930 kilometres (580 mi) that would be integrated with the neighboring networks. Although the plans were ready, the construction of the motorway network was much slower than in neighboring countries because the project was deemed not to be urgent. Because of economic growth in the 1960s, more citizens could afford cars, and the call for good-quality roads was higher than ever before. In each year between 1965 and 1973, over 100 kilometres (62 mi) of motorway were built. At the end of the 1970s, the construction of motorways slowed down again due to costs, combined with an economic crisis, more expensive fuel and changing public opinion. In the following years, the only investments done were to complete already started motorway constructions. But most important cities were already connected. In 1981, the responsibilities for construction and maintenance of the motorways shifted from the federal to the regional governments. This sometimes caused tensions between the governments. For example, the part of the ring road around Brussels that crosses Wallonian territory has never been finished, since only Flanders suffers from the unfinished ring. Belgium today has the longest total motorway length per area unit of any country in the world. 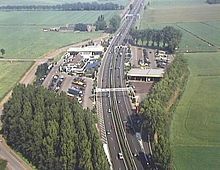 Most motorway systems in Belgium have at least three lanes in each direction. Nearly all motorways have overhead lighting including those in rural areas. The dense population of Belgium and the still unfinished state of some motorways, such as the ring roads around Brussels and Antwerp cause major traffic congestion on motorways. On an average Monday morning in 2012, there was a total of 356 kilometres (221 mi) of traffic jams and the longest traffic jam of the year was 1,258 kilometres (782 mi), purely on the motorways. Bosnia and Herzegovina has more than 40 kilometres (25 mi) of highway, which connects Kakanj-Sarajevo. There is a plan to build highway on Corridor Vc, which will go from river Sava, across Doboj, Sarajevo and Mostar to Adriatic Sea. Next sections are Kakanj-Drivuša 16 km, Zenica Sjever-Drivuša 11 km, Svilaj-Odžak 11 km, Vlakovo-Tarčin 20 km, Počitelj-Bijača 21 km. Legislation in Bulgaria defines two types of highways: motorways (Aвтомагистрала, Avtomagistrala) and expressways (Скоростен път, Skorosten pat). The main differences are that motorways have emergency lanes and the maximum allowed speed limit is 140 km/h (87 mph), while expressways do not have emergency lanes and the speed limit is 120 km/h (75 mph). As of June 2018[update], 777 kilometres (483 mi) of motorways are in service, with another 62 kilometres (39 mi) under various stages of construction. More than 590 kilometres (370 mi) are planned. Also, several expressways are planned. The primary high-speed motorways in Croatia are called autoceste (singular: autocesta; Croatian pronunciation: [ˈaʊtotsesta]), and they are defined as roads with at least three lanes in each direction (including hard shoulder) and a speed limit of not less than 80 kilometres per hour (50 mph). The typical speed limit is 130 kilometres per hour (81 mph). As of 2017, there are 1,313 kilometres (816 mi) of motorways in Croatia. There is also a category known as brza cesta, meaning "expressway". These roads can legally have a speed limit up to 110 kilometres per hour (68 mph) and are often grade-separated, but the latter is not legally required. Motorways (Greek: αυτοκινητόδρομος, Turkish: Otoyol) connect all cities in Cyprus, although in the territory under de facto Turkish control these do not meet international standards for the definition of motorways. In the areas administered by the Republic of Cyprus, motorway numbers are prefaced with the letter A, and run from A1 to A6, to distinguish them from all other roads, designated B roads. Of the A roads, all are designated motorways, except for the A4, linking Larnaca with Larnaca Airport. Motorways are also distinguishable by the use of green-backed road signs, with standard international graphics, and text in yellow in Greek and white in English, distinguishable from B road signage, which has signs with blue backgrounds. Motorway junctions are theoretically designated with junction numbers, but signage is not consistent is indicating the exit numbers. The Czech Republic has currently (2016) 1,247 kilometres (775 mi) of motorways (dálnice) whose speed limit is 130 kilometres per hour (81 mph) (or 80 kilometres per hour [50 mph] within a town). The total length should be 2,000 kilometres (1,200 mi) around 2030. The number of a motorway (in red) copies the number of the national route (in blue) which has been replaced by the motorway. There are also roads for motorcars (silnice pro motorová vozidla). Those common roads are not subject to a fee (in form of vignette) for vehicles with total weight up to 3.5 tonnes (3.4 long tons; 3.9 short tons) and their speed limit is 110 kilometres per hour (68 mph), partially up to 130 kilometres per hour (81 mph). Denmark has a well covered motorway system today, which has been difficult to build due to the county's geography with many islands. The longest bridges are the Great Belt and the Øresund bridges to Skåne (Scania) in southern Sweden. Both are motorways with dual electrical train tracks added. A motorway tunnel across the Fehmarn Belt to Germany is planned. Around Copenhagen, two ring motorways have been built. Even roads with fewer than 10,000 vehicles per day have been built in the most northern part of Jutland. This was done to assure that all ferry traffic is directed to the motorway system as soon as possible. Finland has 863 kilometres (536 mi) of motorway, which is only a small proportion of the whole highway network. More than half of the length of the motorway network consists of six radial motorways originating in Helsinki, to Kirkkonummi (Länsiväylä), Turku (Vt1/E18), Tampere (Vt3/E12), Tuusula, Heinola (Vt4/E75) and Hamina (Vt7/E18). These roads have a total length of 653 kilometres (406 mi). The other motorways are rather short sections close to the biggest cities, often designed to be bypasses. The motorway section on national roads 4 and 29, between Simo and Tornio, is said to be the northernmost motorway in the world. Finnish motorways do not have a separate road numbering scheme. Instead, they carry national highway numbers. In addition to signposted motorways, there are also some limited-access two-lane expressways, and other grade-separated four-lane expressways (perhaps the most significant example being Ring III near Helsinki). The Autoroute system in France consists largely of toll roads, except around large cities and in parts of the north. It is a network of 11,882 kilometres (7,383 mi) worth of motorways. Autoroute destinations are shown in blue, while destinations reached through a combination of autoroutes are shown with an added autoroute logo. Toll autoroutes are signalled with the word péage (toll). Germany's network of controlled-access expressways includes all federal Autobahnen and some parts of Bundesstraßen and usually no Landesstraßen (State Highways), Kreisstraßen (District Highways) nor Gemeindestraßen (municipal highways). The federal Autobahn network has a total length of 12,917 kilometres (8,026 mi) in 2014, making it one of the densest networks in the world. The German autobahns have no general speed limit (though about 47% of the total length is subject to local and/or conditional limits), but the advisory speed limit (Richtgeschwindigkeit) is 130 km/h (81 mph). The lower class expressways usually have speed limits of 120 km/h (75 mph) or lower. An autobahn with 4 lanes in each direction of travel for 21 kilometres (13 mi). The section between Zeppelinheim and Darmstadt is the oldest Autobahn. Dynamic traffic signs on an Autobahn. Greece's motorway network has been extensively modernised throughout the 1980s, 1990s and especially the 2000s, while part of it is still under construction. Most of it was completed by mid 2017 numbering around 2,500 kilometres (1,600 mi) of Motorways, making it the biggest highway network in Southeastern Europe and the Balkans and one of the most advanced in Europe. There are a total of 10 main routes throughout the Greek mainland and Crete, from which some feature numerous branches and auxiliary routes. Most important motorways are the A1 Motorway connecting Greece's two largest cities (Athens and Thessaloniki), the A2 (Egnatia Odos) motorway, also known as the "horizontal road axis" of Greece, connecting almost all of Northern Greece from west to east and the A8 Olympia Motorway connecting Athens and Patras. Another important motorway is the Attiki Odos motorway, the main beltway of the Athens Metropolitan area. In Hungary, a controlled-access highway is called an autópálya (plural autópályák). In Ireland the Local Government (Roads and Motorways) Act 1974 made motorways possible, although the first section, the M7 Naas Bypass, did not open until 1983. The first section of the M50 opened in 1990, a part of which was Ireland's first toll motorway, the West-Link. However it would be the 1990s before substantial sections of motorway were opened in Ireland, with the first completed motorway—the 83-kilometre (52 mi) M1 motorway—being finished in 2005. Under the Transport 21 infrastructural plan, motorways or high quality dual carriageways were built between Dublin and the major cities of Cork, Galway, Limerick and Waterford by the end of 2010. Other shorter sections of motorway either have been or will be built on some other main routes. In 2007 legislation (the Roads Bill 2007) was created to allow existing roads be designated motorways by order because previously legislation allowed only for newly built roads to be designated motorways. As a result, most HQDCs nationwide (other than some sections near Dublin on the N4 and N7, which did not fully meet motorway standards) were reclassified as motorways. The first stage in this process occurred when all the HQDC schemes open or under construction on the N7 and N8, and between Kinnegad and Athlone on the N6 and Kilcullen and south of Carlow on the N9, were reclassified motorway on 24 September 2008. Further sections of dual carriageway were reclassified in 2009. As of December 2011, the Republic of Ireland has around 1,017 kilometres (632 mi) of motorways. The world's first motorway was the Autostrada dei laghi, inaugurated on 21 September 1924 in Milan. 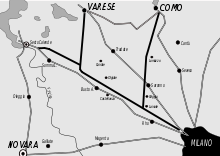 It linked Milan to Varese; it was then extended to Como, near the border with Switzerland, inaugurated on 28 June 1925. Piero Puricelli, the engineer who designed this new type of road, decided to cover the expenses by introducing a toll. Other motorways built before the Second World War in Italy were Naples-Pompeii, Florence-Pisa, Padua-Venice, Milan-Turin, Milan-Bergamo-Brescia and Rome-Ostia. Type B highways (or strada extraurbana principale), commonly but unofficially known as superstrada, are divided highways with at least two lanes for each direction, a paved shoulder on the right, no cross-traffic and no at-grade intersections. Access restrictions on such highways are exactly the same as on autostrade, as is the signage at the beginning and the end of the highway (the only differences being the background colours and the maximum speed limit: blue instead of green and 110 kilometres per hour [68 mph] instead of 130 kilometres per hour [81 mph]). Dynamic traffic signs on an Autostrada. There are two categories of controlled-access highways in Lithuania: expressways (Lithuanian: greitkeliai) with maximum speed 120 km/h and motorways (Lithuanian: automagistralės) with maximum speed 130 km/h. The first section Vilnius–Kaunas of A1 highway was completed in 1970. Kaunas–Klaipėda section of A1 was completed in 1987. Vilnius-Panevėžys (A2 highway) was completed in stages during the 1980s and finished in the 1990s. Complete length of the motorway network is 310 km. Expressway network length - 80 km. Motorway section between Kaunas and the Polish border is planned to be completed in the 2020s. Motorway junction with U-turns. A2 motorway near Raguva. Roads in the Netherlands include at least 2,758 kilometres (1,714 mi) of motorways and expressways, and with a motorway density of 64 kilometres per 1,000 km2 (103 mi/1,000 mi2), the country has one of the densest motorway networks in the world. About 2,500 kilometres (1,600 mi) are fully constructed to motorway standards, These are called Autosnelweg or simply snelweg, and numbered and signposted with an A and up to three digits, like A12. They are consistently built with at least two carriageways, guard rails and interchanges with grade separation. Since September 2012, the nationwide maximum speed has been raised to 130 km/h (81 mph), but on many stretches speed is still limited to 120 or 100 km/h (75 or 62 mph). Dutch motorways may only be used by motor vehicles both capable and legally allowed to go at least 60 km/h (37 mph). Dutch roads are used with a very high intensity in relation to the network length and traffic congestion is common, due to the country's high population density. Therefore, since 1979 large portions of the motorway network have been equipped with Variable Message Signs and dynamic electronic displays, both of which are aspects of intelligent transportation systems. These signs can show a lower speed limit, as low as 50 km/h (31 mph), to optimize the flow of heavy traffic, and a variety of other communications. Additionally there are peak, rushhour or plus lanes, which allow motorists to use the hard shoulder as an extra traffic lane in case of congestion. These extra lanes are observed by CCTV cameras from a traffic control center. Local and express lanes connected using a basketweave. Less common, but increasingly, separate roadways are created for local / regional traffic and long distance traffic. This way the number of weaving motions across lanes is reduced, and the traffic capacity per lane of the road is optimised. A special feature of Dutch motorways is the use of Porous Asphalt Concrete, which allows water to drain efficiently, and even in heavy rain no water will splash up, in contrast to concrete or other road surfaces. The Netherlands is the only country that uses PAC this extensively, and the goal is to cover 100% of the motorways with PAC, in spite of the high costs of construction and maintenance. All in all the Netherlands has one of the more advanced motorway networks in the world. Norway has (2016) 509 kilometres (316 mi) of motorways, in addition to 427 kilometres (265 mi) of limited-access roads (in Norwegian motortrafikkvei) where pedestrians, bicycles, etc. are forbidden, though with a bit lower standard than true motorway. Most of the network serves the big cities, chiefly Oslo and Bergen: see also the E6, E18 and the E39. 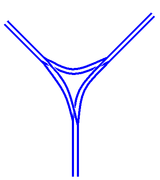 Most motorways use four-ramp Dumbbell interchanges, but also Roundabout interchanges can be found. The first motorway was built in 1964, just outside Oslo. The motorways' road pattern layout is similar to those in the US and Canada, featuring a yellow stripe towards the median, and white stripes between the lanes and on the edge. The speed limits are 90–110 kilometres per hour (56–68 mph). The highways in Poland are divided into motorways and expressways. As of January 2019, there are 1,717 kilometres (1,067 mi) of motorways (autostrady, singular: autostrada) and 2,241 kilometres (1,392 mi) of expressways (drogi ekspresowe, singular: droga ekspresowa). Motorways in Poland are limited-access roads which can be only dual carriageways. Additionally, there were also 116 kilometres (72 mi) of motorways under construction (January 2019). Expressways in Poland are limited-access roads which can be dual or, rarely, single carriageways. There were about 1,167 kilometres (725 mi) of expressways in various stages of construction (January 2019). The start of an expressway in Poland is marked with sign of white car on blue background, while number sign for an expressway is of red background and white letters, with the letter S preceding a number. 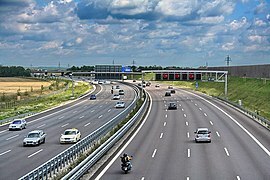 On 15 May 2004 the Regulation of the Council of Ministers (on the network of motorways and express roads) referred to a network of motorways and expressways in Poland totaling about 7,805 kilometres (4,850 mi) (including about 2,000 kilometres (1,240 mi) of motorways). Regulation from February 2007 added roads S2 and S79 to the list. Regulation from October 2009 supplemented plans with road S61. A1 motorway links Lisbon to Oporto. It is a toll road for most of its length and is explored by Brisa. A1 was completed in 1991. Portugal was the third country in Europe—after Italy and Germany—to build a motorway (Portuguese: autoestrada, plural: autoestradas), opening, in 1944, the Lisbon-Estádio Nacional section of the present A5 (Autoestrada da Costa do Estoril). Additional motorway sections were built in the 1960s, 1970s and early 1980s. However, the large-scale building of motorways started only in the late 1980s. Currently, Portugal has a very well-developed network of motorways, with about a 3,000-kilometre (1,900 mi) extension, that connects all the highly populated coastal regions of the country and the main cities of the less populous interior. This means that 87% of the Portuguese population lives at less than 15 minutes' driving time from a motorway access. Unlike the neighbouring Spanish network, most of Portuguese motorways are tolled, although there are also some non-tolled highways, mostly in urban areas, like those of Greater Lisbon and Greater Oporto. In the late 1990s and early 2000s, the Government of Portugal created seven shadow toll concessions, the SCUT toll (Sem custos para o utilizador, no costs for the user). In those concessions it were included more than 900 kilometres (560 mi) of motorways and highways, some of them already built, others which were built in the following years. However, due to economical and political reasons, the shadow toll concept was abolished between 2010 and 2011, with electronic toll equipment being installed in these motorways, to charge their users. Having only electronic tolls, former SCUT motorways can now only be used by vehicles equipped with electronic payment devices or vehicles registered in the system. Portuguese motorways form an independent network (Rede Nacional de Autoestradas, National Motorway Network), that overlaps with the Fundamental and Complementary subnetworks of the National Highway Network (Rede Rodoviária Nacional). Each motorway section overlapping with the Fundamental subnetwork is part of an IP (Itinerário principal, Principal route) and each motorway section overlapping with the Complementary subnetwork is part of an IC (Itinerário complementar, Complementary route). Thus, a motorway can overlap with sections of different IP or IC routes and - on the other hand - an IP or IC route can overlap with sections of different motorways. An example is A22 motorway, which overlaps with sections of IP1 and of IC4 routes; another example is IP1 route, which overlaps with sections of the A22, A2, A12, A1 and A3 motorways. The National Motorway Network has a proper numbering system in which each motorway has a number prefixed by the letter "A". In most cases, a motorway signage indicates only its A number. The number of the IP or IC of which a motorway section is a part is not signed except in some short motorways which lack a proper A number. The first motorway in Romania was completed in 1972, linking Bucharest and Pitești. As of January 2019, Romania has 803 kilometres (499 mi) of motorways in use, with more under construction. The Romanian Government has adopted a General Master Plan for Transport that was approved by the European Union in July 2015, containing the strategy for expanding the road (including motorway) network until 2040, using EU funding. Motorways (Serbian: Аутопут, translit. Autoput) and expressways (Serbian: Брзи пут, translit. Brzi put) are the backbone of the road system in Serbia. There are around 780 kilometres (480 mi) of motorways in total . Plan is 1,200 kilometres (750 mi) by the end of 2018. Motorways in Serbia have three lanes (including emergency lane) in each direction, signs are white-on-green, as in the rest of former Yugoslavia and the normal speed limit is 130 kilometres per hour (81 mph). Expressways, unlike motorways, don't have emergency lanes, signs are white-on-blue and the normal speed limit is 100 kilometres per hour (62 mph). As the Serbian word for motorway is "autoput", the "A1", "A2" or "A3" road designations are used since November 2013. All state roads categorized as class I, that are motorways currently of in the future, are marked with one-digit numbers and known as class Ia. All other roads, which belong to class I, are marked with two-digit numbers and known as class Ib. Expressways belong to class Ib, too. E-numeration is also widely used on motorways. The core of the motorways is what was once called during Yugoslav period, the Brotherhood and Unity Highway, which was opened in 1950 and goes from the border with Croatia, through Belgrade, Central Serbia, Niš, and to border with North Macedonia. It was one of the first modern highways in Cetral-Eastern Europe. It is the most direct link between Central and Western Europe with Greece and Turkey, and subsequently the Middle-East. The Spanish network of autopistas and autovias has a length of 16,583 kilometres (10,304 mi). Autopistas are specifically reserved for automobile travel, so all vehicles not able to sustain at least 60 km/h (37 mph) are banned from them. General speed limits are mandated by the Spanish Traffic Law as 60–120 km/h (37–75 mph). Specific limits may be imposed based on road, meteorological or traffic conditions. Spanish legislation requires an alternate route to be provided for slower vehicles. Many, but not all, autopistas are toll roads, which also mandates an alternate toll-free route under the Spanish laws. Sweden has the largest motorway network in Scandinavia (2,050 kilometres, 1,274 mi). It is, however, unevenly allocated. Most motorways are located in the south of the country, where the population density is the highest. The first motorway in Sweden opened in 1953, between Lund and Malmö. Four-lane expressways had been built before, an early example is E20 between Gothenburg and Alingsås, built in the early 1940s. Most of the current network was built in the 1970s and 1990s. E6 starts i Trelleborg in southern Sweden, it then continues along the Swedish western coast, up to the Svinesund bridge which is where Sweden borders to Norway. Its length is close to 600 kilometres (370 mi) on Swedish territory alone, and it connects four of Scandinavia's six largest cities, Copenhagen, Malmö, Gothenburg and Oslo together, as well as around 20 other more or less notable towns and cities. A Swedish (partly motorway) route (rather than road) that also has a significant portion of the Swedish motorway network, is European route E4, which runs from the border city of Tornio in northern Finland to Helsingborg in southern Sweden. E4 is the main route that connects the capital Stockholm with Scania. All of E4 south of the city Gävle is of motorway standard, with only the part passing Ljungby (32 kilometres, 20 mi) left, currently in expressway standard. Upgrade to motorway standard will start in 2017. The part of E4 that runs through western Stockholm is called Essingeleden and is the busiest road in Sweden. Other highways that have a significant portion of motorway standard are E20, E18 and E22. Motorways in Sweden are however not restricted to European routes; so called Riksvägar and other regional road types can also be of motorway standard. An example of this is Riksväg 40. Riksväg 40 is the main link between the largest cities in the country, Stockholm and Gothenburg. Notably, not even the majority of the European route- network in Sweden is motorway or even have expressway standard. All of this is because road numbering and road standard is separate in Sweden, as in the rest of Scandinavia. Motorways (Turkish: Otoyol) of Turkey are a network in constant development. Some motorways require toll (using only RFID methods), mostly six lanes wide, illuminated and with a 120 km/h (75 mph) speed limit. In 2013, the motorways were 2,155 kilometres (1,339 mi) long in total. the A1(M) between the M62 in North Yorkshire and Washington in Tyne and Wear is built to full 'M' class standards without any roundabouts. the A74(M) between Gretna and Abingdon in Scotland is similarly built to full 'M' class standards with no roundabouts. Legal authority existed in the Special Roads Act (Northern Ireland) 1963 similar to that in the 1949 Act. The first motorway to open was the M1 motorway, though it did so under temporary powers until the Special Roads Act had been passed. Work on the motorways continued until the 1970s when the oil crisis and The Troubles both intervened causing the abandonment of many schemes. The M1 Pacific Motorway is the major road transport link between the cities of Sydney and Brisbane. Australia's major cities, Sydney, Melbourne, Brisbane and Perth, feature a network of freeways within their urban areas, while Canberra, Adelaide, Hobart and the regional centres of Newcastle, Geelong, Gold Coast and Wollongong feature a selection of limited-access routes. Outside these areas traffic volumes do not generally demand freeway-standard access, although heavily trafficked regional corridors such as Sydney–Newcastle (M1 Pacific Motorway (F3)), Sydney–Wollongong (M1 Princes Motorway (F6)), Brisbane–Gold Coast (M1 Pacific Motorway), Melbourne–Geelong (M1 Princes Freeway), Perth-Mandurah (SR2 Kwinana Freeway) and that form part of major long-distance routes feature high-standard freeway links. The M31 Hume Highway/Freeway/Motorway connecting Sydney and Melbourne and the M23 Federal Highway spur route that connects Canberra with Sydney are the only major interstate highways that are completed to a continuous dual carriageway standard. In addition, construction on the A1/M1 Pacific Highway/Motorway connecting Sydney and Brisbane is underway to upgrade the M1 to freeway standard by 2020. There are also plans to upgrade the A25 Barton Highway, another spur off the M31 that connects Canberra with Melbourne, to a dual carriageway highway. Although these inter-city highways are dual carriageway they are not all controlled access highways. Most of these inter-city highways have driveways to adjacent property and at-grade junctions with smaller roads. Unlike many other countries, some of Australia's freeways are being opened to cyclists. As the respective state governments upgrade their state's freeways, bicycle lanes are being added and/or shoulders widened alongside the freeways. The state of Queensland is an exception however, as cyclists are banned from all freeways, including the breakdown lane. The term Motorway in New Zealand encompasses multilane divided freeways as well as narrower two- to four-lane undivided expressways with varying degrees of grade separation; the term Motorway describes the legal traffic restrictions rather than the type of road. New Zealand's motorway network is small due to the nation's low population density and low traffic volumes making it uneconomical to build controlled-access highways outside the major urban centres. New Zealand's first motorway opened in December 1950 near Wellington, running from Johnsonville to Tawa. This five-kilometre (3.1 mi) motorway now forms the southern part of the Johnsonville-Porirua Motorway and part of State Highway 1. Auckland's first stretch of motorway was opened in 1953 between Ellerslie and Mount Wellington (between present-day exit 435 and exit 438), and now forms part of the Southern Motorway. Most major urban areas in New Zealand feature limited-access highways. Auckland, Wellington, Christchurch and Dunedin contain motorways, with only Auckland having a substantial motorway network. ^ Portions of the Downtown Connector in Atlanta, Georgia have eight lanes in each direction. ^ "Glossary of Statistical Terms". OECD. 26 February 2004. Archived from the original on 10 August 2011. Retrieved 3 September 2009. ^ a b "COMMON ACCIDENT DATA SET : Reference Guide" (PDF). Ec.europa.eu. Version. 3.4. April 2015. Archived from the original (PDF) on 4 June 2016. Retrieved 18 July 2017. ^ "Built to Meander, Parkway Fights to Keep Measured Pace". The New York Times. 6 June 1995. Archived from the original on 14 May 2013. Retrieved 13 April 2010. ^ Hershenson, Roberta (18 June 1995). "Bronx River Parkway On an Endangered List". The New York Times. Archived from the original on 14 May 2013. Retrieved 13 April 2010. ^ "German Myth 8 Hitler and the Autobahn". German.about.com. Archived from the original on 8 May 2006. ^ Shragge, John & Bagnato, Sharon (1984). From Footpaths to Freeways. Ontario Ministry of Transportation and Communications, Historical Committee. p. 55. ISBN 978-0-7743-9388-1. ^ Karnes, Thomas L. (2009). Asphalt and Politics: A History of the American Highway System. Jefferson, NC: McFarland & Co. p. 131. ^ Korr, Jeremy (2008). "Physical and Social Constructions of the Capital Beltway". In Mauch, Christof & Zeller, Thomas (eds.). 'The World Beyond the Windshield: Roads and Landscapes in the United States and Europe. Athens: Ohio University Press. p. 195. ^ Roig-Franzia, Manuel (22 November 2001). "The Town That Stops Traffic: Travelers Encounter Way Station as Way of Life in Breezewood". Washington Post. p. B1. ^ "Chapter 2, Section 5". Access Management Manual. Texas Department of Transportation. Archived from the original on 21 July 2011. ^ "Median Barriers Prove Their Worth". Public Works. 123 (3): 72–73. March 1992. ^ "Controlled-Access Highways as Bikeways" (PDF). Arizona Department of Transportation. PGP 1030. Archived from the original (PDF) on 24 December 2005. ^ "OAR Banning Non-Motorized Travel On Some Interstate Freeways in Oregon" (PDF). Oregon Department of Transportation. Archived from the original (PDF) on 31 May 2010. Retrieved 12 October 2009. ^ "Using the Highway". Your Rights: The Liberty Guide to Human Rights. Liberty. 18 August 2008. Archived from the original on 9 February 2013. Retrieved 31 January 2013. ^ "Bicycling facts and figures". Archived from the original on 20 July 2008. ^ "Roadway Design Manual". Texas Department of Transportation. March 2010. 6: Freeways. Archived from the original on 14 May 2013. Retrieved 28 March 2013. ^ "Woodruff Road Corridor Study" (PDF). 2013. Chapter 4*: Interchange Modifications. Archived from the original (PDF) on 1 June 2013. Retrieved 28 March 2013. ^ "13: Motorway Signs, Signals and Road Markings". Road Signs. ukmotorists.com. Archived from the original on 29 May 2012. Retrieved 24 April 2012. ^ "Introduction: Highway Statistics 2011, Highway Statistics Series". Federal Highway Administration. Archived from the original on 22 March 2014. Retrieved 21 March 2014. ^ Jost, Graziella & Pogorelov, Evgueni (19 February 2008). "Fate of EU Motorway Safety in Hands of MEPs" (PDF) (Press release). European Transport Safety Council. Archived (PDF) from the original on 8 April 2014. Retrieved 7 April 2014. ^ "International Traffic and Accident Data: Selected Risk Values for the Year 2010" (PDF). Bundesanstalt für Straßenwesen (Federal Highway Research Institute). December 2012. Archived (PDF) from the original on 7 April 2014. Retrieved 10 September 2013. ^ "Highway Statistics: Table VM-2: Vehicle-miles of travel, by functional system; Table FI-10: Persons fatally injured in motor vehicle crashes, by Federal-aid highways". Federal Highway Administration. December 2012. Archived from the original on 7 September 2013. Retrieved 10 September 2013. ^ "Traffic and Accident Data: Summary Statistics: Germany" (PDF). Bundesanstalt für Straßenwesen (Federal Highway Research Institute). December 2012. Archived (PDF) from the original on 8 April 2014. Retrieved 7 April 2014. ^ "Unfallentwicklung auf deutschen Straßen 2012" [Crashes on German Roads 2012] (PDF). Statistisches Bundesamt (Federal Statistics Office). 10 July 2013. Archived (PDF) from the original on 14 November 2013. Retrieved 23 September 2013. ^ "German minister rules out end to unlimited motorway speeds | ETSC". Etsc.eu. Archived from the original on 25 May 2017. Retrieved 18 July 2017. ^ "German Autobahn: The Speed Limit Debate" (PDF). SPEED Fact Sheet. February 2008. ^ Albalate, Daniel; Bel, Germà (2012). "Motorways, tolls and road safety: Evidence from Europe". Series. 3 (4): 457–473. doi:10.1007/s13209-011-0071-6. ^ Olsen, Jonathan R.; Mitchell, Richard; MacKay, Daniel F.; Humphreys, David K.; Ogilvie, David (2016). "Effects of new urban motorway infrastructure on road traffic accidents in the local area: A retrospective longitudinal study in Scotland". Journal of Epidemiology and Community Health. 70 (11): 1088–1095. doi:10.1136/jech-2016-207378. PMC 5541177. PMID 27279082. ^ Montella, Alfonso; Imbriani, Lella Liana; Marzano, Vittorio; Mauriello, Filomena (2015). "Effects on speed and safety of point-to-point speed enforcement systems: Evaluation on the urban motorway A56 Tangenziale di Napoli". Accident Analysis & Prevention. 75: 164–178. doi:10.1016/j.aap.2014.11.022. PMID 25482322. ^ Aron, Maurice; Billot, Romain; Faouzi, Nour-Eddin EL; Seidowsky, Régine (2015). "Traffic Indicators, Accidents and Rain: Some Relationships Calibrated on a French Urban Motorway Network". Transportation Research Procedia. 10: 31–40. doi:10.1016/j.trpro.2015.09.053. ^ "Freeway Geometric Design for Active Traffic Management in Europe" (PDF). Federal Highway Administration. March 2011. Archived (PDF) from the original on 6 May 2017. This article incorporates text from this source, which is in the public domain. ^ "Public Roads - Comparison of The Safety of Lighting Options on Urban Freeways, Autumn 1994". Federal Highway Administration. 31 January 2017. Archived from the original on 4 September 2017. Retrieved 18 July 2017. ^ "MOU 3007 report.PDF" (PDF). Path.berkeley.edu. Archived (PDF) from the original on 9 August 2017. Retrieved 18 July 2017. ^ Martin, Hugo (20 April 2003). "Sounding Off On Noise: Freeways' Neighbors Struggle To Drown Out Road Racket, Experts Say The Din Creates Mental And Physical Hazards". Los Angeles Times. p. B1. ^ Jacobs, Jane. The Death and Life of Great American Cities. [full citation needed]. ^ McCreery, Sandy (23 July 2001). "Don't just sit there, enjoy it!". New Statesman. p. 23. ^ Coulombe, Gerard (6 July 1986). "Doing The Turnpike Crawl". The New York Times. p. CN16. ^ Spivak, Jeffrey (27 July 1999). "Today's Road Opening Represents Progress, Pain". Kansas City Star. p. A1. ^ Noise Pollution and Abatement Act of 1972. S. Rep. No. 1160, 92nd Cong. 2nd session. ^ Hogan, C. Michael & Latshaw, Gary L. (21–23 May 1973). The Relationship between Highway Planning and Urban Noise. Proceedings of the ASCE, Urban Transportation Division Specialty Conference. Chicago: American Society of Civil Engineers, Urban Transportation Division. Archived from the original on 18 May 2007. ^ "TransApex - Brisbane City Council". 17 June 2007. ^ "Myth: We need big roads anyway, even for sustainable transport". Victoria: Public Transport Users Association. Archived from the original on 22 January 2018. Retrieved 22 January 2018. ^ Cervero, Robert (Spring 2003). "Road Expansion, Urban Growth, and Induced Travel: A Path Analysis". Journal of the American Planning Association (Submitted manuscript). 69 (2): 145–164. doi:10.1080/01944360308976303. ^ Martin, Hugo (10 April 2002). "Will More Freeways Bring More Traffic?". Los Angeles Times. p. B1. ^ Van Hengel, Drusilla; Dimento, Joseph; Ryan, Sherry (1999). "Equal Access? Travel Behaviour Change in the Century Freeway Corridor, Los Angeles". Urban Studies. 36 (3): 547–562. doi:10.1080/0042098993529. ^ Borth, Christy (1969). Mankind on the Move: The Story of Highways. Washington, DC: The Automobile Safety Foundation. pp. 248, 264. ^ Mohl, Raymond A. (2008). "The Interstates and the Cities: The US Department of Transportation and the Freeway Revolt, 1966–1973". The Journal of Policy History. 20 (2): 193–226. doi:10.1353/jph.0.0014. ^ Taylor, Brian D. (Winter 1995). "Public Perceptions, Fiscal Realities, and Freeway Planning: The California Case". Journal of the American Planning Association (Submitted manuscript). 61 (1): 43–59. doi:10.1080/01944369508975618. ^ "How the Motorways Were Numbered" (Memorandum). Ministry of Transport. November 1961. Archived from the original on 9 November 2007. Retrieved 28 December 2007 – via Pathetic Motorways. ^ a b Wykes, C. H. (7 July 1959). "How the Motorways Were Numbered" (Memorandum). Ministry of Transport. Archived from the original on 8 November 2007. Retrieved 28 December 2007 – via Pathetic Motorways. ^ Payne, B. A. (10 July 1959). "How the Motorways Were Numbered" (Memorandum). Ministry of Transport. Archived from the original on 8 November 2007. Retrieved 28 December 2007 – via Pathetic Motorways. ^ "The Northern Ireland Assembly". Northern Ireland Assembly. Archived from the original on 23 December 2008. Retrieved 10 August 2009. ^ a b "Roads Act 1993 (Classification of National Roads) Order 2006" (PDF). Department of Transport (Republic of Ireland). 2006. Archived from the original (PDF) on 17 December 2008. Retrieved 8 April 2007. ^ "European Traffic Police Network (TISPOL)" (PDF). Archived (PDF) from the original on 2 June 2013. Retrieved 7 April 2012. ^ "Transportation: Roads". South Africa: Stats and Facts. Archived from the original on 27 July 2011. Retrieved 15 June 2010. ^ "Section 1A.13". Manual on Uniform Traffic Control Devices (Rev 1, 2003 ed.). Federal Highway Administration. para. 29. Archived from the original on 13 May 2006. See also 23 CFR 750.153(k). ^ This part of the word's meaning was codified in 1939 at Section 23.5 of the California Streets and Highways Code. "Archived copy". Archived from the original on 27 July 2009. Retrieved 30 May 2011. CS1 maint: Archived copy as title (link) See also People v. Scheinman, 248 Cal. App. 2d 180, 182, 56 Cal. Rptr. 168, 168–169 (1967) (interpreting Section 23.5 to find that a property owner had deeded to the State just the access from the side of his property directly abutting a future freeway but not the access through a connecting road that the state wished to close in order to upgrade an expressway to a freeway). ^ "Section 1A.13". Manual on Uniform Traffic Control Devices (Rev. 1, 2003 ed.). para. 27. Archived from the original on 13 May 2006. ^ AASHO Highway Definitions. Washington DC: American Association of State Highway Officials. 1962. pp. 1–3. ^ Raitz, Karl B.; Thompson, George F. (1996). The National Road. JHU Press. pp. 34–. ISBN 978-0-8018-5155-1. Taylor, Craig; Mittler, Elliott; Lund, Le Val (1998). Overcoming Barriers: Lifeline Seismic Improvement Programs. ASCE Publications. pp. 173–174. ISBN 978-0-7844-7460-0. Schwantes, Carlos A. (2003). Going Places: Transportation Redefines the Twentieth-Century West. Indiana University Press. pp. 272–273. ISBN 978-0-253-34202-7. ^ California Streets & Highways Code § 257. ^ "§ 160.02, subds. 18b & 19". Minnesota Statutes. ^ "§ 65-5-3, subds. (b) and (c)". Mississippi Code Annotated. ^ "§ 304.010". Missouri Revised Statutes. ^ "§§ 60-618.01 and 60-621". Nebraska Revised Statutes. ^ "§ 24-01-01.1". North Dakota Century Code. 2006. ^ "§ 4511.01, subds. (YY) and (ZZ)". Ohio Revised Code Annotated. Archived from the original on 6 October 2014. Retrieved 4 October 2014. ^ "§§ 59.84(1)(b) and 346.57(1)(am)". Wisconsin Statutes. ^ "§ 4511.01, subd. (ZZ)". Ohio Revised Code Annotated. Archived from the original on 6 October 2014. Retrieved 4 October 2014. ^ "freeway". American Heritage Dictionary. Archived from the original on 24 August 2008 – via bartleby.com. ^ "过去五年新增铁路里程1.97万公里 新增高速公路4.2万公里 - 2013两会 - 新华网". News.xinhuanet.com. Archived from the original on 15 November 2013. Retrieved 23 July 2013. ^ MacLeod, Calum (29 January 2006). "China's Highways Go the Distance". USA Today. Archived from the original on 5 October 2010. Retrieved 2 May 2010. ^ a b Kumar, Ashutosh. "Expressway cost pegged at Rs20 crore/km". Daily News and Analysis. Archived from the original on 25 September 2012. Retrieved 16 September 2016. ^ a b Dash, Dipak Kumar (23 November 2009). "By 2022, govt to lay 18,637km of expressways". Times of India. Archived from the original on 26 November 2009. ^ "Welcome to NHAI". NHAI. Archived from the original on 14 April 2015. Retrieved 23 July 2013. ^ "Ministry of Road Transport & Highways". Morth.nic.in. Archived from the original on 21 July 2012. Retrieved 18 July 2017. ^ "Manado people ask govt accelerate Trans Sulawesi". Antaranews.com. 22 April 2012. Archived from the original on 29 November 2016. Retrieved 5 September 2016. ^ "Statistics Bureau Home Page/JAPAN STATISTICAL YEARBOOK 2016 - Chapter 12 Information and Communication". Stat.go.jp. Archived from the original on 25 May 2017. Retrieved 18 July 2017. ^ "道路：道の相談室：道に関する各種データ集". 国土交通省. Retrieved 16 March 2019. ^ "TravelSmarter". TravelSmarter.com.my. Archived from the original on 25 June 2017. Retrieved 18 July 2017. ^ "Expressways in Singapore: Did you know?". The Highway. Automobile Association of Singapore. July 2001. Archived from the original on 10 March 2006. Retrieved 5 April 2006. ^ "Quy hoạch phát triển mạng đường bộ cao tốc Việt Nam đến năm 2020 và định hướng đến năm 2030 ( Planning on development of Vietnam's expressway network up to 2020 and orientation to 2030)". Thư viện Pháp luật (in Vietnamese). 1 March 2016. ^ "Đường cao tốc Việt Nam đắt gấp 2-4 lần thế giới?". news.zing.vn (in Vietnamese). 15 June 2017. Archived from the original on 15 June 2017. ^ SitiosArgentina.com.ar. "Señales De Transito". Sitiosargentina.com.ar. Archived from the original on 25 May 2017. Retrieved 18 July 2017. ^ "Transport statistics at regional level - Statistics Explained". Ec.europa.eu. 18 January 2012. Archived from the original on 20 July 2017. Retrieved 18 July 2017. ^ "RIS - Gesamte Rechtsvorschrift für Bundesstraßengesetz 1971 - Bundesrecht konsolidiert, Fassung vom 18.07.2017". Ris.bka.gv.at. 29 November 2008. Archived from the original on 25 May 2017. Retrieved 18 July 2017. ^ "OVERZICHT. Hier staan we het meest in de file - Het Nieuwsblad". Nieuwsblad.be. 22 March 2013. Archived from the original on 22 June 2017. Retrieved 18 July 2017. ^ "Nooit gezien: 1.258 km file door sneeuwval - België". Knack.be. 3 February 2012. Archived from the original on 27 June 2017. Retrieved 18 July 2017. ^ "Greek Motorways: The country's "road Metro" has now emerged - ypodomes.com" (in Greek). Archived from the original on 4 August 2017. Retrieved 3 August 2017. ^ "Transport 21 Infrastructure Plan, Ireland". Transport21.ie. Archived from the original on 21 November 2010. Retrieved 15 December 2010. ^ "German Myth 8: Hitler's Autobahn?". Archived from the original on 8 May 2006. Retrieved 3 April 2006. ^ "1924 Mile Posts". Archived from the original on 12 March 2008. Retrieved 3 April 2006. ^ "Magistralės jubiliejus". Transporto pasaulis. Archived from the original on 22 July 2011. Retrieved 25 March 2010. ^ "CIA World Factbook | Field listing: Roadways". Central Intelligence Agency. 2012. Archived from the original on 22 May 2014. Retrieved 7 July 2014. ^ a b "Road traffic, vehicles and networks | Environment at a Glance 2013: OECD Indicators" (PDF) (Press release). Paris, France: OECD Publishing. 2013. Retrieved 10 July 2014. ^ "Autosnelweg" [Motorway]. WegenWiki (in Dutch). 2012. Archived from the original on 11 July 2014. Retrieved 17 July 2014. ^ "Start Page | Public enterprise for state roads". Roads.org.mk. Archived from the original on 8 August 2017. Retrieved 18 July 2017. ^ "Iptana, 50 de ani de proiectare pentru infrastructura transporturilor" (PDF) (in Romanian). Iptana. 10 September 2003. Archived (PDF) from the original on 24 September 2015. Retrieved 8 August 2015. ^ "Documente Master Plan General de Transport" (in Romanian). Romanian Ministry of Transport. Archived from the original on 22 March 2015. Retrieved 8 August 2015. ^ "Sveriges vägnät - Trafikverket". Trafikverket.se. 28 June 2016. Archived from the original on 18 July 2015. Retrieved 18 July 2017. ^ "150706 Hela E6 motorväg från Köpenhamn till Oslo –". E6.se. Archived from the original on 25 May 2017. Retrieved 18 July 2017. ^ "I dag invigs sista etappen av E 6 | Göteborgs-Posten - Göteborg". Gp.se. 6 July 2015. Archived from the original on 25 May 2017. Retrieved 18 July 2017. ^ Linda Bergh (6 July 2015). "Tog 60 år att bygga klart motorvägen | GT". Expressen.se. Archived from the original on 25 May 2017. Retrieved 18 July 2017. ^ "E4, Ljungby–Toftanäs, motorväg - Trafikverket". Trafikverket.se. 20 September 2016. Archived from the original on 9 July 2017. Retrieved 18 July 2017. ^ "A New Way to Travel". Archived from the original on 24 November 2011. ^ "Special Roads Act 1949" (PDF). Office of Public Sector Information. Archived (PDF) from the original on 29 February 2008. Retrieved 31 December 2007. ^ a b "Statistics". Motorway Archive. The Motorway Archive Trust. Archived from the original on 3 October 2007. Retrieved 18 November 2007. ^ "Opening dates for Motorways in the UK in chronological order". Motorway Archive. The Motorway Archive Trust. Archived from the original on 2 December 2008. Retrieved 18 November 2007. ^ Porter, John & Bridle, Ron (2002). The Motorway Achievement. Thomas Telford. p. 223. ISBN 978-0-7277-3196-8. ^ "M25 London Orbital Motorway (Junctions 13 to 30)". Motorway Archive. The Motorway Archive Trust. Archived from the original on 22 December 2008. Retrieved 31 December 2007. ^ Porter, John & Bridle, Ron (2002). The Motorway Achievement. Thomas Telford. p. 189. ISBN 978-0-7277-3196-8. ^ "Conceptions and early history of the motorways in Northern Ireland". Motorway Archive. The Motorway Archive Trust. Archived from the original on 11 October 2007. Retrieved 31 December 2007. ^ "M1 Belfast to Dungannon and M12 to Craigavon". Motorway Archive. The Motorway Archive Trust. Archived from the original on 9 October 2007. Retrieved 31 December 2007. ^ "Westlink (M1 to M2)". Motorway Archive. The Motorway Archive Trust. Archived from the original on 13 October 2007. Retrieved 31 December 2007. ^ "Part 3: Motorways and Expressways". Manual of Traffic Signs and Markings (MOTSAM). NZ Transport Agency. June 2009. ^ "FAQs". Transit New Zealand. Archived from the original on 19 June 2008. Retrieved 21 March 2007. ^ "CMI Transit". Archived from the original on 22 February 2008. Retrieved 7 June 2007. This page was last edited on 21 April 2019, at 20:06 (UTC).